The community of Fort Garry is about a 10-minute walk from Downtown Winnipeg. In proximity to the city, Fort Garry experiences an identical continental climate. Residents of the area can enjoy the summer and winter seasons to the fullest. They have hot and humid summer weather perfect for lake activities and frigid cold temperatures bringing snow for outdoor recreation. As enjoyable as the varying weather patterns in Fort Garry can be for activities, the heating and air conditioning Winnipeg homes have does not feel the same way about the climate! When you live in a continental climate like the one you find in Fort Garry, your HVAC systems can malfunction under the pressure of keeping up with extreme switches in weather. When the air is dry, heaters can have a tough time warming the air. Equally, in high humidity, air conditioners can work overtime trying to cool down the wet air. Coils, pumps, and fans can malfunction in HVAC units due to these variables, and anyone who has the internet could probably fix the issue. But at Provincial Heating & Cooling we’re not interested in quick fixes. After operating in the Fort Garry area for over 20 years, we’ve learned a trick or two about staying ahead of severe weather changes and apply this knowledge to our quality services. Provincial Heating & Cooling has an expert team available to assist you 24hrs a day. We provide some of the best quality services in the area and are growing leaders in our industry. Our team of factory technicians is trained to repair, install, or provide guidance on a variety of different systems. For customers looking for new systems, we will always recommend the best. 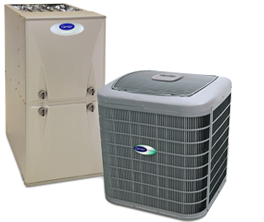 That is why Provincial Heating & Cooling is a Carrier Factory Authorized Dealer for the world-class Carrier products. We provide the top of the line equipment based on performance and functionally- these systems are exceptional! For customers who are looking for regular maintenance and repairs, our Pro Service Plan is comprehensive, convenient, and offered at an affordable, competitive price. Provincial Heating & Cooling value our customers more than anything, and to prove it we extend everyone a 100% Satisfaction Guarantee. We also provide products and repair discounts, priority services, and peace of mind knowing your heating and cooling equipment is in excellent hands. Fort Garry weather can be surprising, but you don’t want any surprises when it comes to your HVAC systems. You want to know they work when they should, and that is what Provincial Heating & Cooling is set out to ensure. Call us today for a free estimate on your home or residential space! Your prompt reply ( and same day on-site visit) to my initial email requesting a new furnace quote was very much appreciated. All the Provincial Heating workers who were involved in the new furnace installation were very polite and respectful. Everything was done as per your quote and at the stated cost, with no unexpected extras. I am very satisfied with the work and , based on my experience, wouldn’t hesitate to recommend your company to people I know. Thanks for a job well done!